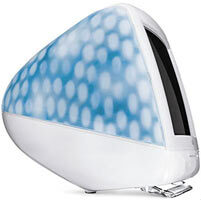 Announced in February 2001, the iMac SE brought a number of small improvements over the previous high-end iMac, in addition to a dramatic change in the iMac "colors". Apple chose to get rid of Sage and Ruby in favor of "Blue Dalmatian" and "Flower Power", two new patterns that were molded into the case using a technique which took Apple 18 months to perfect. The iMac SE featured a CD-RW drive, a new and improved PPC 750cx processor, which had an on-chip 1:1 L2 Cache, and a speedy new graphics chip. It featured a 600 MHz processor, 128 MB of RAM, a 40 GB hard drive and a 56 kbps modem, was available in Graphite, Blue Dalmatian or Flower Power, and was priced at $1499.